Celebrating the milestone of 50 shows, this week we have a very special broadcast. Hellfire Machina and Mantis Radio exclusively present Wu-Tang (Enter The Dubstep). In 2005 the Wu-Tang released Wu-Tang Meets The Indie Culture Vol. 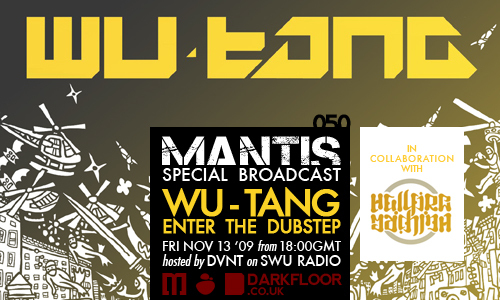 1, and Mantis Radio are ecstatic to have an exclusive mix of the follow up Wu-Tang Meets The Indie Culture Vol. 2: Enter The Dubstep. 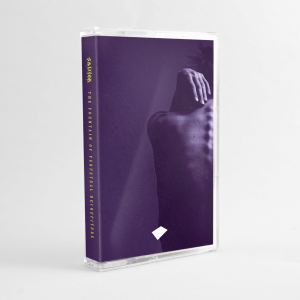 Headed up by previous Mantis Radio guests, Hellfire Machina, this release is huge. As Vol. 1 sought to introduce hip-hop fans in general, and specifically, the famously large, loyal and diverse fan-base of the Wu-Tang to the burgeoning world of underground hip-hop, so Vol. 2 seeks to expose another untapped resource of underground talent, skill and artistry to this very same avid and intrepid fan-base. The project serves a double purpose as well: many of the pioneers and practitioners (DJ’s and producers) in the Dubstep world came up in a time when Wu-Tang ruled the international airwaves. Unlike much commercial hip-hop, the immediacy of Wu-Tang’s sound spoke to many outside of the scope of the typical hip-hop fan, across oceans and at home. Their music and style helped to shape an emerging artform that hadn’t yet defined itself. Now, in 2009, as dubstep continues to grow, expand and encompass more styles and subgenres, the Wu-Tang sound is reintroduced into the mix, to spawn a new and unique musical crossbreeding, that is greater than the sum of its constituent parts. This groundbreaking album is trail-blazing the collaboration between Dubstep and Hip-Hop, with stomach-pounding, bass-thumping guttural beats, and gully, gritty and grimy lyrics that break into the next decade in the chapters of each respective genre’s history. With Scuba, Parson, Trillbass, Dakimh, DZ, Rogue Star, Stenchman, Datsik & many more producing not remixes, but complex re-interpollations that include a veritable goldmine of Wu-Tang verses from the vaults that feature Raekwon, Ghostface Killa, RZA, GZA, Method Man, U-God & Masta Killa, Wu affiliates Killah Priest, Bronze Nazareth, Prodigal Sunn, Solomon Childs, Son One + more, and guest spots from Busta Rhymes, MF Doom, Pimp C, Three 6 Mafia, Ras Kass, Vast Aire, Canibus, Lord Jamar + many more, this one of a kind compilation is at the forefront of an emerging cultural and musical blend that is taking place on the margins of the mainstream. Thank you to everyone who has listened and supported the show over the 2.5 years I’ve been producing it. Here’s to the next 50 shows!